Thanks man. No suspension updates really. I've mainly been working on the engine bay. The springs are 10" long. These are bearings I used. Yep, the sleeve just rests on the bottom. And yes on the rear, It's still the 3" drop spring and Monro Matic Plus air assist struts. Where did you get the sleeves and springs? Did they come as a kit? or did you piece it together? I used this sleeve but had to have it bored out in two areas to make it fit over the GP AGX. Others have used this sleeve instead with success. This is the coilover nut that goes with those sleeves. There are 10" long, 2.5", 400 lb springs on the A1 Racing site but I chose these springs. For the top mount, my solution was to take a stock 92-99 top mount and weld a 1/2-3/4" section of 2.5" OD pipe to the bottom to center the spring. Weld inside the pipe to the top mount. 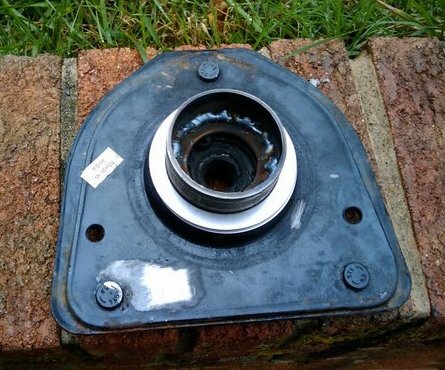 Use a large plumbing pipe cutter, it'll pinch the top and bottom of the section making the bearing an interference fit until it gets to the base. Meaning.. if done correctly, you'll have to push the bearing on to the section but it shouldn't fall off, which is perfect. Lube the crap out of the bearings and clean/re-lube at least once a year. I run bearings up top as shown and also on the bottom of the spring. Also, reference the W-body/F-body pdf earlier in this thread for adapting the W strut shaft for working with the stock top mount. Thank you! I have been over the pdf too. Just wanted to know where you got the stuff to do it. What damping setting do you run your agx's? Do you need the 2000+ wheel bearings with the knuckle or will the stock bearings work on the new knuckles? You need to do the 00 bearing with the 00 knuckle. On the 92-99 the bearing gets bolted to and thread into the knuckle. On the 00+ the bolts through the knuckle and thread into the bearing. What sway bars are out there for an upgrade on our 95 h bodys? so what I am gathering from this post is that the knuckles and struts from a post 2000 either lesabre, or bonneville will bolt up to the factory lower control arms of my 98 oldsmobile. just as long at i swap the strut tower bracket to be able bolt up into the strut tower. Also how does the factory calipers on my Olds work ibolting to the late model knuckle, is it all the same? An 00+ H-Body front knuckle will work with your front ball joints on your stock LCAs. And obviously the 00+ front strut bolts up to that. I dont know if the 00+ spring top diameter or the strut shaft works with a 95-99 top mount. I know W-body springs and struts will work since that's what I used. The difference in 92-99 and 00+ brakes is outlined in my how-to. They bolt up differently and aren't compatible. Various front brake options are available with the 00+ knuckle though. And agian, this is front only.